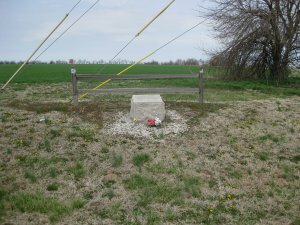 Directions: The Missouri State Guard Line of Battle Historical Marker [ Waypoint = N37 17.794 W94 19.473 ] is located north of Carthage, Missouri, 64386 at the intersection of Civil War Avenue and State Route M (Base Line Blvd). If you are heading directly from US 71 . . .
Take the exit for SR M (Base Line Blvd). After exiting US 71 onto SR M, head west for about one mile. Find a safe place to park near the intersection with Civil War Avenue. The granite marker is located on the north side of Base Line Blvd. If you are leaving from the Carthage Town Square . . .
Take Grant Street heading north for a couple of blocks. Turn left (west) on Central Avenue (SR 96) and travel for about 3 blocks. Turn right (north) on Garrison Avenue. Continue heading north for about 2 miles and take the ramp onto US 71 heading north. Drive north on Hwy 71 for about 6 miles and take the exit for SR M (Base Line Blvd). Turn left (west) on SR M and drive for approximately one mile until you get to Civil War Avenue (left hand turn). About 1 o'clock on the morning of the 5th I received an order from your excellency to take up the line of march at 4 a.m. southward towards Carthage . . . About 7 a.m., having marched some 5 miles, our scouts reported the enemy in force 3 miles in advance. I immediately went forward with some of my staff to reconnoiter their movements and examine the ground. [We determined] that they were descending a slope towards a creek skirted on both sides with timber . . . The ground upon which our army was drawn up was a high ridge of prairie, gently sloping southward, with undulations to a creek about one mile and a quarter distant. In front of our right was a large field of corn extending to the timber on the creek. The enemy, under command of Colonel Sigel, apparently about 2,000 strong, with seven pieces of artillery, took up their position on the north side of the creek, about three-quarters of a mile from the timber. Right Flank: To your far right, Rains deployed the Eighth Division's cavalry. Right Center: To your immediate right, Rains deployed the Eighth Division Infantry (about 1,800 strong) commanded by Colonel Richard H. Weightman along with Bledsoe's Battery (3 guns) commanded by Captain Hiram M. Bledsoe. Middle: Right where you are standing, Rains deployed the Sixth Division (about 650 strong) commanded by Brigadier General Monroe Mosby Parsons along with Guibor's Battery (4 guns) commanded by Captain Henry Guibor. Left Center: To your immediate left, Rains deployed the Fourth Division Infantry(about 1,200 strong) commanded by Brigadier General William Yarnel Slack. Left Left Center: To the left of Slack's command, Rains deployed the Third Division Infantry(about 365 strong) commanded by Brigadier General John Bullock Clark, Sr.
Left Flank: To your far left, Rains deployed the Fourth and Sixth Division's cavalry. Rear Guard: Governor Jackson stayed north of the line of battle with approximately 2,000 unarmed Missouri State Guard recruits. Although the Missouri State Guard had initially formed on the ridge behind you to the north, by 0900h it had moved forward to where you are standing. There were approximately 4,000 troops struggling to get prepared for battle. Rains, in operational command, was positioned with the cavalry on the right flank. If you look to the south towards Carthage you can get an idea where Sigel was forming his battle line. Sigel's line formed about three quarters of a mile south of where you are standing. It was just to the north of Double Trouble Creek south of the line of trees you see in the distance. The engagement was begun about 8.30 o'clock a.m. by the enemy's artillery, which opened a heavy fire of round shot, shell, spherical-case shot, and grape. 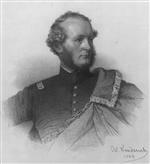 This was promptly responded to by the artillery of General Parsons' division, four 6-pounders . . . the fire from the enemy's artillery was rapid and well directed, and continued for forty minutes. Our loss, owing to the fact that our line presented no depth to them, was small.